SOME NOTES ON A NONENTITY covers Lovecraft’s entire life from birth to his untimely and painful death and will be launched at NecronomiCon this coming weekend with a presentation from Sam and Jason on Saturday morning. I wish we could be there—break a leg, guys! Since his death in 1937, H. P. Lovecraft and his works have become an overwhelming part of popular culture. 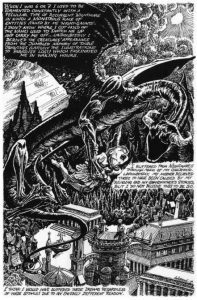 His creation, Cthulhu, has appeared in films, cartoons, video games, music and virtually all other parts of popular media. However, although many may know Lovecraft’s creations, few people know the details of his extraordinary life. SOME NOTES ON A NON-ENTITY: THE LIFE OF H. P. LOVECRAFT is a biography of this enigmatic and legendary writer. 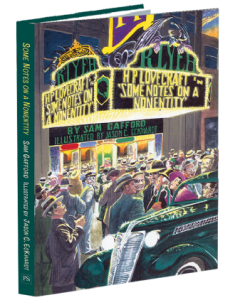 SOME NOTES ON A NON-ENTITY is a 120+ page graphic novel written by SAM GAFFORD and illustrated by JASON ECKHARDT. 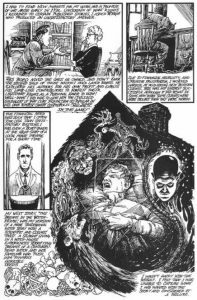 Based on years of research into the primary sources regarding Lovecraft’s life, this graphic novel spans Lovecraft’s youth to his later years. Episodes covered include his odd relationship with an overpowering mother; his brief sojourn in New York City and disastrous marriage; the creation of his most amazing tales; and his physically painful decline to an eventual death while considering himself a complete and utter failure. Gafford is a weird literature scholar who has written about Lovecraft for several critical magazines and is a founding organizer of the NecronomiCon convention which celebrates Lovecraft’s life and work. Eckhardt is an award winning artist who has received great acclaim for his covers for such publishers as Necronomicon Press, Hippocampus Press and others. Recently, his work has been featured in the highly reviewed ANNOTATED H. P. LOVECRAFT by Leslie Klinger. 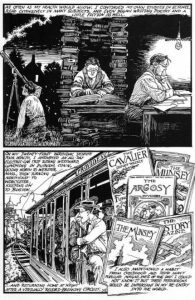 Together, these two respected creators have developed what will surely be considered THE graphic novel biography of the man who has been hailed as second only to Edgar Allan Poe as America’s most important writer of weird literature.